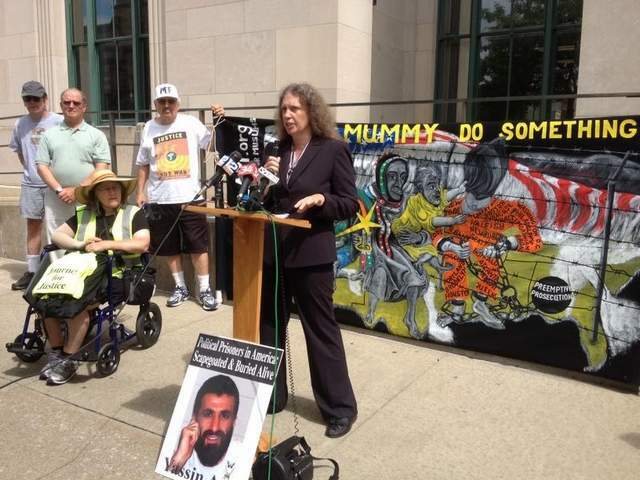 In the summer of 2013, Lynne Jackson from Project SALAM organized a 133-mile walk from Albany to Binghamton to advocate for a new appeal by Yassin Aref, a Kurdish imam who was entrapped by a criminal con artist hired by the FBI. Yassin is innocent and is currently serving a 15 year sentence. The headline starts at exactly 15:00. I had the honor of meeting Elliot Adams and his wife Ann, on the Journey for Justice. I heard Elliot speak at the Peacemakers of Schoharie Valley. His description of the torture of the men in Guantanamo is stomach churning. How can we, as Americans, allow this to happen? Elliot has been fasting in solidarity with the men in Guantanamo. The plight of these men is horrific. Can you imagine being kept without charge, without trial for more than 11 years, with no hope of being relesased? With no way to communicate with loved ones? Without having seen one’s family in all those years? The most basic right in our constitution is the right to a fair trial and face one’s accusers. Holding men with no charge or trial is illegal and against the constitution. It is un-American. I am glad to be home. Just a little update on how I am – my blister is healing, I expect to be back to going on long walks soon. I miss walking in the early morning. There is nothing quite like walking shortly after dawn in the quiet. For the first time since the near drowning incident at Sidney (see: https://projectsalam.wordpress.com/2013/07/21/day-8/), I looked very closely at by wonderful little canoe. The boat was crushed in the incident, and when my husband, Dan Van Riper freed it from the strainer, and Dan managed to push it back into shape. 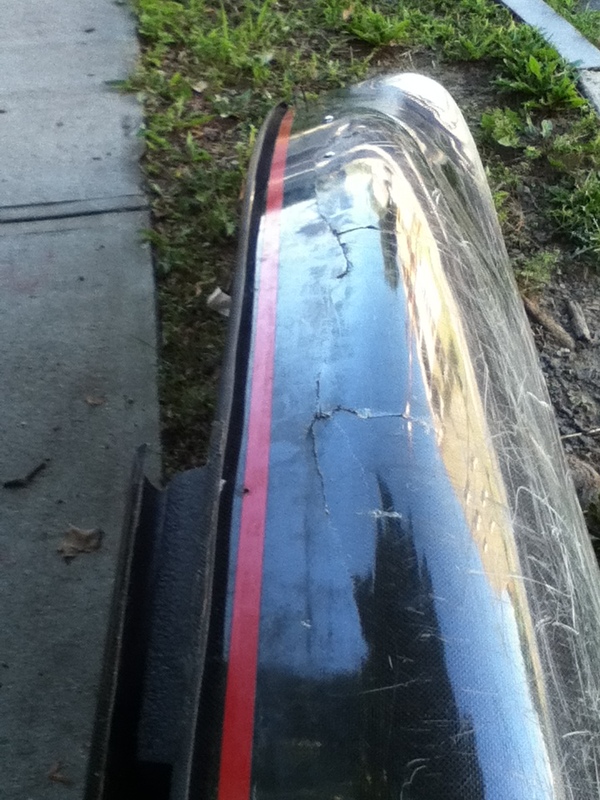 There are a lot of horizontal cracks in the boat. In this photo, you cannot see the cracks, but, they are there! The seat is loose, and the front piece at the bow is missing. Here is an close-up of some of the cracks. Dan and I took my little Hornbeck canoe back to Hornbeck boats today to see if it can be repaired. I was pleasantly surprised when Chad, at Hornbeck boats, said that yes, the boat can be repaired. It may take a while, but, yes the boat can be fixed. It won’t look like new (Dan says it will now have “street cred”), and the cracks will still be visible on the outside, but it will work just fine. The boat weighed 12 pounds when I bought it. I expect it will gain a few pounds during the repair. But, that is OK. 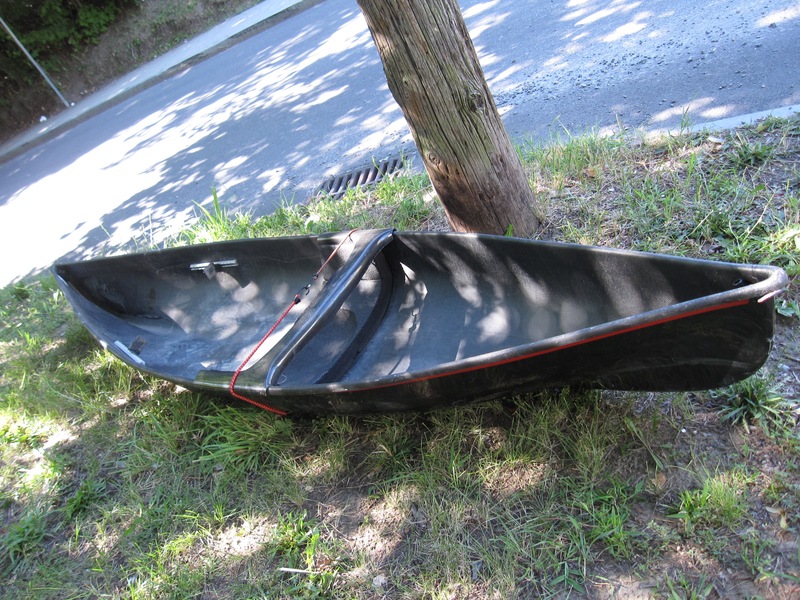 It will still be an extremely lightweight canoe which I will be able to easily carry around. While at Hornbeck’s, we bought me a new, lightweight paddle and a new life vest. 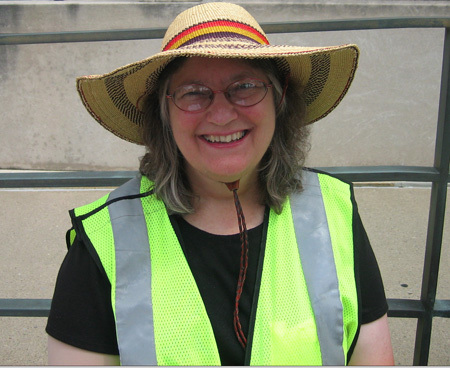 I cannot emphasize enough how important wearing a life vest is. People say to me “oh, I can swim.” A life vest has nothing to do with swimming. The only purpose of a life vest is when a paddler is tossed out of her boat, that the life vest will bring her head out of the water so that she can be rescued. The ability to swim has nothing to do with this. I was tossed from my boat in less than a second. I had no time to grab anything – let alone grab a life vest and put it on. Fortunately, I always wear a life vest. My life vest got my head above water, which allowed me stand in the water and cling to a branch so I was not dragged away by the current. This gave Dan enough time to rescue me from the raging Susquahanna river current. Though I was only a few feet from the shore, the current was so strong, I could not get out of the river. Dan held out his paddle to me, and I clung to the paddle as Dan pulled me through the raging current to the shore. So, please, if you go paddling, please, please wear a life vest! I am disappointed that I could not walk the last 26 miles. I look at my stupid blister (yes, I did take a photo because Steve Downs asked me to – but yuck, but, really NO ONE wants to see it, Steve!) and even how much it has healed so far, I realize, I still can’t go walking long distances yet. But, in the end, my walking was no longer important. What was important was the people we met and the relationships and community we built. I want to keep in contact with all the wonderful people I met along the way. And, I need to write more about my adventures and what it is like to walk a really long distance in our car-oriented society today. Our country was built by people walking long distances – I think it is interesting how doing it today is such a big news story. Our justice system may be broken. Our rights may be gone. But, Americans are really good people and I met a lot of them on my trip. Not one person said anything negative to any of us walking. Not one. People were just so nice to us. Perhaps this is my Universalism coming out, but, I do believe that people, if given the choice, will do the right thing and that people are basically good and decent. And people do want justice for everyone. I had so much support from so many people. I thank you all for your interest, support and help! And, most of all, I hope for good things for Yassin Aref. The Altamont Enterprise published photos of our first day walking. At Stewart’s in Guilderland, I had run into Jerry Hauser (who I had not seen in years) and he noticed that Melissa Hale Spenser, editor of the Altamont Enterprise, was just driving up (see: https://projectsalam.wordpress.com/page/2/). Best of all, the Altamont Enterprise published and editorial about Yassin Aref. In the print version (I highly recommend subscribing, at $29 a year, it is the best bargain! ), the editorial is accompanied by a startling drawing – me walking, Yassin in an hour-glass prison with the sands running out, and the women and children walking. A very moving drawing. If you think you are going to get a blister or have one, use moleskin to protect it. Bandaids don’t work. Moleskin is amazing stuff. Even the ER doctor recommended moleskin. So, have a package at the ready. You can cut the moleskin to the right size, and moleskin is stretchy and can be formed around the curved parts of the foot. If possible, don’t lance the blister. The outer skin will protect the blister while the fluid in it is reabsorbed. Baby your feet. Wear comfortable shoes. If your feet hurt, its difficult to go to protests! I am glad to be home! The weather yesterday and today has been perfect walking weather, unlike the stifling heat I experienced. I am glad we went paddling on the Susquahanna and I am even more glad my husband, Dan Van Riper rescued me from the river. And, I am very glad we delivered the petitions to the judge! Today was the big day – I would deliver the signed petitions to the clerk of the court. My host, Mary Snyder, made eggs and toast for me for breakfast. We were ready right on time, and set off for the NYSEG Stadium, home of the Binghamton Mets. Mary had put her wheelchair in her car the day before to be all ready. Eleven people from Albany drove down for the march and press conference. My husband, Dan Van Riper, drove Albany Common Council member Dominick Calsolaro. Others who came included Jeanne Finley, Albany County Legislator Doug Bullock, Barbara Murphy, Joe Lombardo, Russell Ziemba, Marwa Elbially, Fred Childs and of course, attorneys Kathy Manley and Steve Downs. We all met at the NYSEG Stadium, and introduced the Binghamton people to the Albany people, and we all had a great time chatting. Eventually, it was time to take the short walk to the Federal Building. It was decided to put me in a wheelchair. I found this quite embarrassing, but, the reality was, my blister made walking even short distances quite difficult. Marwa filmed me. Jack Gilroy, who had walked the remainder of the 26 miles to Binghamton pushed me. The short walk to the Federal Building was quite pleasant. When we arrived, even more people were there. Father Tim Taugher or St Francis of Assisi brought a podium which was a great addition. We set up a banner behind the podium, and placed a photo of Yassin Aref in front of the podium. We were ready to go! Steve Downs was the MC for the event. Kathy Manley spoke eloquently about the case, I spoke about the Journey for Justice, Dominick Calsolaro spoke about the Albany Resolution, Jack Gilroy gave a rousing speech about who the real criminals are, and Joe Lombardo of UNAC read a passionate statement about Yassin’s case. 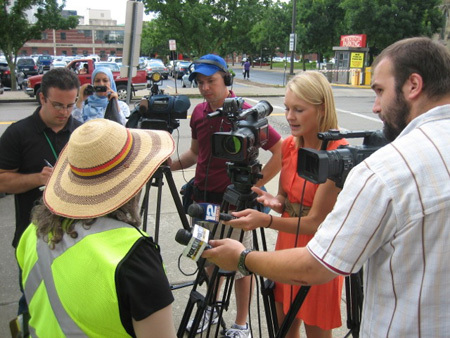 About forty people attended the press conference and rally. Even more people from Albany arrived, including Max and Susan who had joined me a few days ago. Best of all, Mrs. Hossain brought her three daughters and Yassin’s oldest daughter. After the rally, it was time to go into the Federal Building. You would think we were entering Fort Knox, what with all the regulations. I asked the guard if this was indeed a public building, and he said yes, but regulated. To make a long story short (after much argument with the guard), only a few of us were allowed in to deliver the petition. Heaven forbid should 20 of us come into the building (the building is really big, and there seemed like plenty of room for all of us)! It seems that people are only allowed into the Federal Building if they have photo ID. The guards finally decided that Mohammed’s seven-year-old daughter could be let in with no photo ID, as well as Yassin’s 17 year-old daughter. Five of us delivered the petitions – Jack Gilroy, Steve Downs, Alaa, Helema and me. We went up to the court and the court clerk welcomed us with a big smile, took a look at the petitions and happily told us she would file them at the court. We went back outside only to discover a lot of arguing between us, the public, and the guards at the Federal Building. When we all had first entered the building, Dan had taken a photo, and the flash of the camera went off. Seems the guard wanted that photo deleted (the guard told Dan one story about why he wanted the photo and me another story). Kathy was explaining to the guards why it was not illegal to take photos in a Federal Building according to a federal case. When the security guard approached Dan to delete the photo, Dan gave the only American response when a security guard wants to take one’s possessions: “get a warrant.” And walked away. As I came out of the Federal Building, I was surrounded by security guards asking that I get Dan to delete the photo. I argued with them for a long time, long enough for Dan to be many blocks away. This is America. This secrecy nonsense has to stop. The Federal Building is a public building. The people should be allowed to freely enter without having to produce ID, and people should be able to freely photograph what is our building. I had walked 82 miles, paddled 25 miles, and Jack Gilroy had walked the remaining 26 miles. The Journey for Justice was a complete success! We delivered 1715 signatures to the court. Hundreds, thousands, possibly many more people heard about the injustice done to Yassin Aref and Mohammed Hossain who otherwise never would have heard about this injustice. I met dozens and dozens of people on this journey, all of who care about peace and justice. America is a beautiful country, with may people who care deeply about our constitution and what is fair and just. We just need to spread the word! I hope that you will start your own Journey for Justice and continue the journey to peace and justice. Thank you all everyone for all of your help and support!!! !